SpeedUP! Europe FIWARE accelerator HUB to cooperate with DTS Systems Germany. 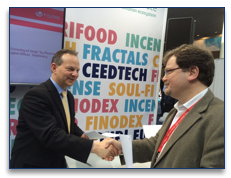 Yesterday both companies signed, at the CeBIT 2015 event, an agreement to operate a FIWARE node from 1st June 2015, with test-running to begin over the next few days. This makes this node the first commercial one of its type designed for use in the productive environment of the European Initiative Future Internet Public Private Partnership, which has been setting new benchmarks since 2011 with the OpenSource software-component framework “FIWARE” – fiware.org. More than a million developer man-hours have been invested in recent years throughout Europe in the creation process and comprehensive testing procedures. In 2015, assistance went out to a total of 1,300 European start-ups and SMEs for the purpose of initiating broad evaluation and deployment in productive environments. Generic software components support, along with other factors, the fast, scalable development of applications involving the Internet of Things (IoT), and can analyse extremely-large quantities of data (BigData) or control industrial robots, 3-D printers and networks of sensors (Factory 4.0). The use of generic OpenSource technologies and open, standardised interfaces is a “key success factor”, in the words of Olaf-Gerd Gemein, the coordinator of SpeedUP! Europe Accelerator, which operates from bases in Hamburg, Copenhagen and Stockholm. “The use of open technologies allows our start-ups and projects to develop, both quickly and effectively, solutions for project ideas, while adopting a worldwide approach to productivity and customer acquisition based on open interfaces. This is essential for the areas of OpenData and SmartCities.” It therefore comes as no surprise to learn that in 2015 more than 60 projects have positioned themselves in the context of SmartCities to offer products and services to towns, cities and their respective residents. The German Federal Ministry for Economic Affairs and Energy has likewise welcomed FIWARE technology. Its current invitation to tender entitled “Smart Service World – Internet-based services for the economy” refers specifically to the use of FIWARE technology. The DTS Systeme GmbH in Germany, is one of the most experienced specialists to have come on board. “As operators of a cloud stamped “Made in Germany”, with maximum specifications regarding cyber security and data protection, it is only natural that we should be supporting an initiative like SpeedUP! Europe with our technology and operating capacity.” says Frank Knischewski, head of DTS Systems’ Hanover branch. With the conclusion of the beta phase during the next few weeks, SpeedUP! Europe, operating in cooperation with DTS Systems, will be offering commercial cloud services based on OpenStack with FIWARE. DTS Systems has been supporting major industrial and commercial business organisations for more than 30 years with advice, design, acquisition, implementation and operating services for secure IT environments. With more than 150 employees, six locations and three in-house research centres, DTS Systems operates on behalf of more than 700 customers in the running of critical departments or even entire IT infrastructures. An own fibre-optic network and a 24/7 helpdesk that operates in the customer’s language round off this range of services.